The memo below outlines potential strategic decisions Twitter (NYSE:TWTR) could make going forward, and evaluates four strategic options to see how they could impact the company’s user base and average revenue per user (ARPU) – and consequently its revenues and earnings. In a recent note, we detailed how the social media company is struggling to monetize its platform, as growth in its user base appears to have stagnated. While Twitter has been able to develop a niche for itself in the extremely competitive social media industry, it has not seen great success in the online advertising market, which is dominated by Google (NASDAQ:GOOG) and Facebook (NASDAQ:FB). In this note, we have put together a strategic analysis regarding Twitter’s path forward in the face of secular headwinds. Executive Summary: Doubling down on its focus on being the go-to app for real-time news and information should allow Twitter to turn things around going forward, at least to an extent. The company has mentioned that live streaming is also an area of focus – and rightly so, given the secular tailwinds driving massive growth in live streaming. However, we expect that the company would run into trouble trying to compete head-to-head with the likes of Amazon, Facebook and Snap in live-streaming sports and entertainment-related events. Rather, Twitter is incredibly well-positioned to improve its position as a news and information provider by introducing more live-streaming news services (in addition to those that have already been announced) and introducing new features making it easier to use the app as a primary news source. If executed well, this strategy could allow the company to accelerate its user growth, while avoiding the significant content-related costs that are associated with live-streaming sports and entertainment-related events. We estimate that this could lead to 6% annual revenue growth in the short term, with the potential for further growth in the future (versus our current forecast of under 1% for our base case model). This translates to annual EBITDA growth exceeding 10% over 2016-2020, as opposed to around 6% under our base case scenario. Below, we present a comparison of four feasible strategic options for Twitter: 1) Continue the Current Model; 2) Content-Focused Approach; 3) News-Focused Approach; and 4) Data-Focused Approach. U.S. active user base will stagnate: We expect Twitter’s U.S. active user base to grow marginally over the next couple of years before settling around 72 million users. Average advertising revenue per U.S. user to improve marginally: Twitter’s considerably smaller user base compared to competitors like Facebook, coupled with a projected slowdown in user base growth, will likely limit growth in advertising revenues going forward. Data licensing revenues to grow steadily: The revenue Twitter generates in the form of access fees to its database of tweets is expected to grow at more than 10% annually over the foreseeable future. Gross margins will trend lower: While we expect Twitter’s strategy of monetizing its social networking platform in its current form to result in stagnating revenues, its cost of revenues are likely to nudge slightly higher each year – resulting in gross margin compression over the coming years. 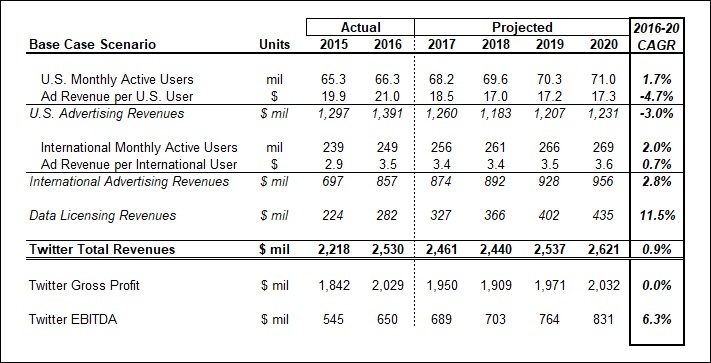 The table below highlights our forecast for key operating metrics at Twitter under the base case scenario. Twitter has expanded its social networking platform of late to include live-streaming capabilities – a move that is clearly aimed at making the most of the growing popularity of online streaming services. There has been a noticeable shift in the manner in which people consumer entertainment, thanks to the proliferation of smartphones, the return of unlimited data plans in the U.S., and the popularity of various online viewing platforms. As a result, many households are doing away with traditional cable TV plans altogether (cord-cutting). Under our content-focused scenario for Twitter, we forecast the company’s financial performance if it were to target growth primarily by live-streaming sports and other entertainment events and programs. This is largely along the lines of what Twitter sought to do by streaming Thursday Night Football on its platform last year. Twitter reportedly paid $10 million to acquire exclusive streaming rights to the 10 NFL games, and generated revenues by selling spots to stream advertisements before and during the event. Twitter did fairly well too – especially due to its ability to customize ads by location as well as user preferences thanks to its core social networking platform. But a content-focused approach to growth has a significant drawback: this model really only works well if a company has exclusive broadcasting or streaming rights to a particular event. And the more popular the event, the more expensive those rights will be. The high level of competition in the streaming space only inflates these costs further. Twitter learned this firsthand when its attempt to acquire exclusive streaming rights to Thursday Night Football again this year were thwarted by the much larger Amazon. Notably, Twitter’s bid for these streaming rights were placed along with industry giants like Google and Facebook, before Amazon closed the deal for $50 million (a 400% increase from the figure for last year’s deal). As we pointed out earlier, Twitter has yet to turn profitable, and also has comparatively little cash on hand. This puts it in an extremely weak position compared to deep-pocketed competitors who are also keen on grabbing a sizable share of the live-streaming market. At the same time, Twitter’s attempt to differentiate its streaming service from other players by integrating a live tweet-stream with the event has been met with mixed reviews – with many users complaining that the constantly updating tweet feed distracts them while watching the main content. This issue could limit the number of users that will use Twitter to watch live content – putting the company at a very real risk of not being able to generate enough advertising revenues to cover the costs incurred to acquire streaming rights. Initiative-specific active users: We forecast the average number of users drawn to Twitter purely to watch its live-streaming events to grow rapidly to around 30 million by 2020 and to exceed 40 million by 2023. Initiative-specific average advertising revenue per user: The exclusive nature of live-streaming content will allow Twitter to generate higher advertising revenues per user compared to its base platform. We forecast these figures to be roughly $22.50 per live-streaming user in 2020, and we expect it to increase steadily over our forecast period. Additional initiative-related costs: As we pointed out earlier, this strategy would attract considerable content costs which will have to be borne by Twitter upfront. We forecast a steep increase in content costs year after year over the forecast period. Based on these assumptions, we believe that Twitter’s revenues could grow by almost 7% annually over coming years under this scenario. However, the higher content costs result in the company’s EBITDA growth figure shrinking from over 6% in the base case to 5.5% under this scenario. Under our news-focused scenario for Twitter, we forecast the company’s financial performance if it targets growth focusing on better delivery of news. Twitter has been working along this front over recent months, and has announced deals with several news providers including Bloomberg Media, The Verge, BuzzFeed News and Cheddar to live-stream news content on its platform. We believe this strategy complements the strength of Twitter’s social networking platform, which is used by a large number of users as a primary source of news and current events. The news-focused approach would likely generate much lower revenues per user compared to the content-focused approach, because of the revenue-sharing agreements between Twitter and any news provider. However, we believe that Twitter would also be able to attract more users by focusing on news – something that would partially mitigate the impact of lower advertising revenues per user on the top line compared to the content-focused approach. More importantly, the cost of producing news content would be much lower than for sports and other entertainment events. And even these lower costs would be split between Twitter and the news partners. This implies that a bulk of the revenue generated from streaming news will accrue to the bottom line, as opposed to the content-focused approach where extremely high content costs can potentially erode profits (as detailed above). Initiative-specific active users: We believe that the news-focused approach is a natural extension to Twitter’s base social networking business model, and Twitter will be able to draw more users by streaming news compared to streaming sports or other entertainment content. We forecast the average number of users added by Twitter purely due to news streaming to reach about 54 million by 2020 and to exceed 70 million by 2023. Initiative-specific average advertising revenue per user: As we mentioned above, as advertising revenues will be shared with the news provider, Twitter’s advertising revenues per user will be lower than the figure for the content-focused approach. We forecast these figures to be roughly $10 per viewer as opposed to $22.50 per viewer assumption for the previous approach. Additional initiative-related costs: A news-focused strategy has the advantage of lower content costs. Also, these costs will be incurred by Twitter on a regular basis, as opposed to the upfront content costs in case of streaming rights for sports events. Based on these assumptions, we believe that Twitter’s revenues can grow by almost 6% annually over coming years under this scenario. While this is lower than the 7% revenue growth in the previous scenario, the lower content-related costs could help the company’s EBITDA growth figure jump to over 10% annually from a much lower 5.5% under the content-focused approach. 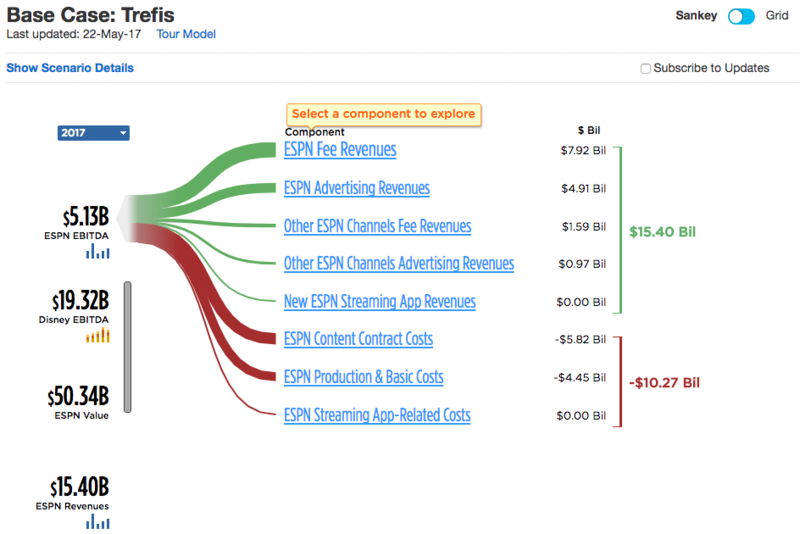 Another strategic path Twitter can explore is one that focuses on monetizing its tweet database. Twitter has amassed trillions of tweets since it was founded, and over the years analytics firms have tapped into this data to identify trends that can be used by organizations ranging from multinational companies to political parties to news agencies to environmental groups. Currently, Twitter grants companies access to its tweet database for a fee, and also charges interested parties for basic data analytics services. But we believe the company is leaving money on the table by not implementing a more in-depth data analytics platform along the lines of many third-party vendors. While this would make Twitter a direct competitor to many vendors who buy access to its database, there is significant upside potential for the company if it can become a one-stop shop for all tweet-related analytics. This approach does have a notable issue, though. There are already concerns being raised among Twitter users about third-party access to the tweet database on the grounds of security and privacy. Twitter’s attempts to monetize this aspect of its business could therefore backfire, and could actually lead to a reduction in user engagement due to these concerns. That said, an advantage Twitter has here over data analytics firms is that a single company managing and analyzing the tweets in-house is a more secure option from a user’s point of view. 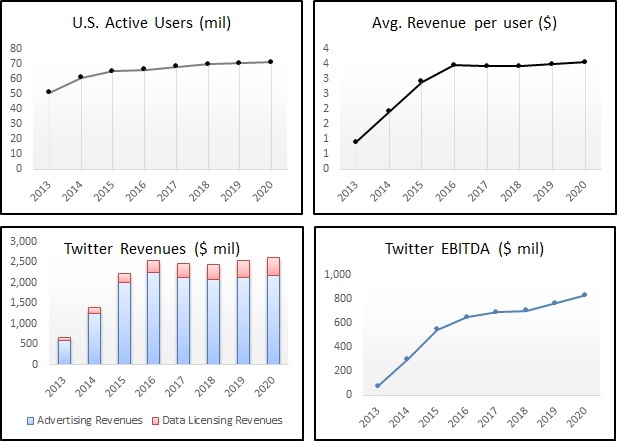 Under the data-focused approach, if Twitter chooses to grow organically over coming years, then we forecast that its data licensing revenues can grow at almost 30% each year as opposed to the ~11% growth figure under the base case. Notably, a potential way forward for Twitter to expand its data business could be to acquire one of the medium-sized established data analytics firms, which could further accelerate growth in these revenues. In the Data-Focused scenario, our analysis shows a 4% annual growth in revenues for Twitter – something that stems from the fact that data licensing is responsible for around 10% of the company’s total revenues. But overall operating expenses in this scenario are well below the figures for the other two approaches, leading to a nearly 10% increase in EBITDA annually. To conclude, a News-Focused strategy could potentially help Twitter improve earnings at a better rate than a Content-Focused, and with less uncertainty than a Data-Focused strategy. While Twitter is currently testing the waters with live sports, entertainment as well as news content, we believe that the company will do best to concentrate its efforts on news and information content going forward.